a Including 3 cases of pulmonary embolism treated with IVC filter placement without mortality Source: From Ref.l. a One patient each required intra-operative diaphragmatic repair b Concomitant pneumothorax in one patient 0 Concomitant pneumomediastinum in one patient each Source: From Ref.l. During retroperitoneoscopy, subcutaneous emphysema extending up to the neck could potentially allow CO2 to enter the superior mediastinum and apical pleural space. During retroperitoneal laparoscopy, the lack of subdiaphragmatic peritoneum may facilitate cephalad tracking of CO2 along the aorta and cava toward the mediastinum. Therefore, pneumomediastinum may be more likely to occur during retroperitoneoscopy. diaphragmatic defects, such as a patent pleuroperitoneal canal or attenuated areas in the diaphragm due to improper embryonic fusion, may allow peritoneal CO2 to gain access into the pleural space (2-4). Retroperitoneally insufflated CO2 can dissect along natural musculofascial planes into the mediastinal space. Once inside the mediastinum, CO2 can gain entry into the pleural cavity through the pulmonary hilum dissecting along pulmonary vasculature, or through a rupture in the mediastinal pleura resulting in pneumothorax formation (2,4). An apical pneumothorax can occur due to the rupture of apical blebs from barotrauma (positive pressure during mechanical ventilation) (3). Aspiration of the pneumothorax could determine whether it occurred due to endotracheal anesthesia and positive pressure ventilation, or due to tissue propagation of carbon dioxide. Other anesthesia-related issues such as pleural injury during central line placement or elevated maximum end-tidal carbon dioxide pressure can be potentially causative (3). During retroperitoneoscopy, subcutaneous emphysema extending up to the neck could potentially allow CO2 to enter the superior mediastinum and apical pleural space (2-4). Inadvertent pleural or diaphragmatic injury is an obvious cause of pneumothorax during renal surgery, open or laparoscopic (5). In a series of 253 open flank operations, pleural injury occurred in 63 cases (25%) (6). In another series of 130 open extraperitoneal live donor nephrectomies, pleurotomy occurred in 11 cases (8.5%) (5). Pleural or diaphragmatic injuries can occur during two specific aspects of a laparoscopic procedure: port insertion or tissue dissection. Del Pizzo et al. recently documented pleural injury in 0.6% of 1765 patients undergoing laparoscopic renal surgery at four institutions (7). 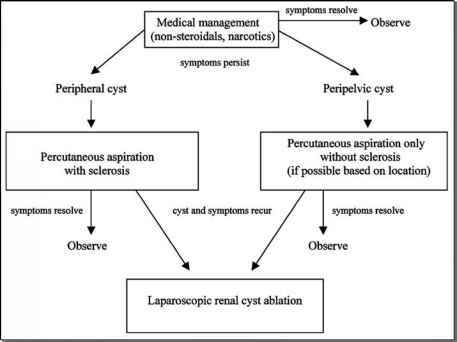 Pleurotomy occurred during transperitoneal laparoscopy (N = 8) while mobilizing the kidney (N = 6) or liver (N = 2), or during retroperitoneal port placement (N = 2). In the series from the Cleveland Clinic, two pleural/diaphragmatic injuries occurred during port insertion for retroperitoneoscopy. In the first case, patient's morbid obesity prevented adequate palpation and identification of the 12th rib, resulting in supracostal port placement with subsequent pleural and diaphragmatic injury. In the second case, the posterior 12 mm port transgressed the most inferior edge of the pleura, resulting in a pneumothorax. Pneumothorax has also been reported following urological laparoscopic surgery in pediatric patients. Waterman et al. reported that out of 285 laparoscopic uro-logic procedures performed at their institution, pneumothorax developed in four pediatric patients (three females, one male) (8). Patient age ranged from 8 months to 11 years (mean 5.4 years). Laparoscopic surgical procedures performed included right upper pole partial nephrectomy, left upper pole partial nephroureterectomy, removal of left multicystic dysplastic kidney and bilateral Cohen reimplantation of ureters. Pneumothorax was suspected due to decreased oxygen saturations, subcutaneous emphysema, increased respiratory effort, and decreased chest lung sounds unilaterally (8). Pneumothorax was confirmed with chest X-rays. Conservative management of pneumothorax was used in three patients and a pigtail chest tube was used in one.